When it comes to knowing a customer’s true value, marketers certainly have their work cut out for them. It’s notoriously challenging to figure out the current profitability of a customer, let alone predict what their value might be in the future. And without this insight, departments like marketing, sales, operations and customer service will all lack a strategy for personalising the overall customer experience. You know the saying – around 20% of your consumers make up 80% of your sales. So naturally, pinpointing the individuals that make up that 20% and catering to them specifically is a great way to boost sales and marketing effectively. You need to determine how much a customer is offering your business – in essence, their lifetime value. Customer Lifetime Value (CLV) is the net profit your business will make from a specific person over the course of their relationship with you. It’s one of the most important customer metrics for companies to be across if they want to effectively target the most valuable customers and predict what their customer base will look like down the road. One of the trickiest parts about determining a CLV is determining what a ‘lifetime’ actually is. Depending on your industry and the nature of your product/service, this could be anywhere from 3-5 years to an actual lifetime (this might be the case with health insurance, for example). A CLV can change regularly depending on your business model, meaning you have to continue revisiting the definition and the calculation on a regular basis. CLV will look very different between industries – in subscription or contractual businesses (banks, telco, insurance etc.) CLV is measured by looking at how long the customer stays with your company, how much they pay during that time for your service, and how profitable they are. In a retail organisation, on the other hand, the CLV will look at how likely customers are to make future purchases (and how much money they’ll spend), not whether they’ll ‘leave’ your organisation. There are often large gaps between purchases in retail businesses, but that doesn’t necessarily mean the customer has left or isn’t valuable – a customer who only shops once a year but spends a significant amount is of higher value than one who shops frequently and spends little. 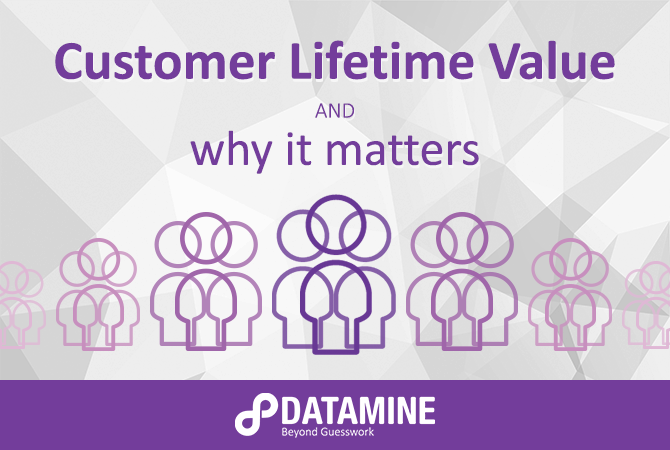 Why do I need to analyse Customer Lifetime Value? Knowing your customers’ lifetime value is important for ensuring the profitability of your business. It enables marketing to direct spend towards high value customers. It allows sales to focus their time on acquiring the most profitable customers. It offers product and operations the direction needed to tailor services and items to the most valuable customers. And it provides customer service teams with a framework for knowing how much time and energy needs to be spent trying to retain and nurture specific customers. Let’s take an example from insurance. Marketing can use a CLV to determine what people are most likely to pay high premiums and not claim – they can use this information to spend their time acquiring customers that will bring the business money. Customer service can use the CLV to know what existing customers are most important to keep happy (e.g. call queue prioritisation) because they have the best lifetime value. And finally, finance and risk can use the predicted CLV to understand how many customers on a given plan or subscription are likely to be around next year. How do I get the best possible customer CLV? The accuracy of this ‘value’ you assign your customer can vary depending on the approach you take – more specifically, how in-depth you go with the analysis of the customer data. The first (and easiest) way to get a sense for a customer’s CLV is simply to subtract the amount of money you spent acquiring them from the overall profit they provided you with, highlighting the relationship between profit, acquisition cost and cost to serve. But that doesn’t look into the future and consider what might happen. Clients often come to us if they don’t have a good way of understanding their historic customer value and if they want help projecting what future value will be – what’s a customer’s likelihood to show up on a sale day? Or respond to offers? What is their average number and value of purchases per year? We’ve found that letting the data speak for itself tends to yield the best results – and that’s done through a Lifetime Value Analysis. Why do you need a CLV? What are the specific actions we’re going to take with this information? Do you need an allowable acquisition cost? Do you need current/potential profit and churn figures, or does your analytics team have them already? Do you have an existing definition for a customer lifetime? Where is this from? Is this a one-off CLV analysis or does it need to be run regularly? What are the deliverables? Who needs to use them? Undertaking your own Lifetime Value calculation? You’re more than welcome to use these questions as both a starting point and a reference to return to throughout the process. They’ve helped lay the foundation for a number of Datamine CLV projects, and they’ll also help you get an idea of where to start. For more information about understanding and unlocking the value in your customers, check out our free Datamine Guide to Creating Customer Insight to the right. This piece was originally published on Marketing Association's blog - you can view the original content here.